Ionized and alkalinized water: Ridiculous health fad debunked. Does Your Water Need More Ions? The latest health fad is even more ridiculous than most health fads. 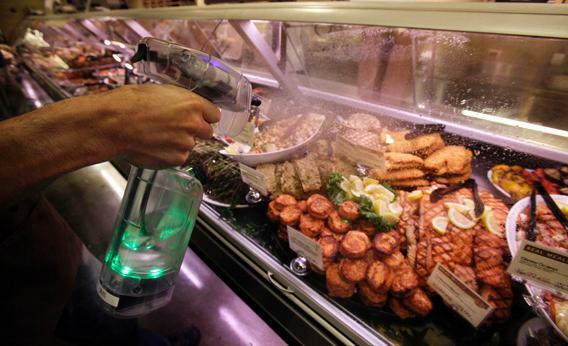 A Whole Foods employee cleans a glass case with an ionized water sprayer in May 2011 in New York. After so many years of neglect, water appears ready to emerge as a cutting-edge health food. Perhaps it’s the fault of Gatorade, that Technicolor concoction of salt, sugar, and water people guzzle to “replenish their electrolytes.” The Gatorade inventors, some dweeby physiologists, were just trying to keep football players from collapsing in the Florida heat. They could not have foreseen what was to transpire in the decades ahead as the concept of the “sports drink” took hold, and then, more bizarrely yet, water itself became a symbol of health and status. With each iteration, beginning with bottled waters derived from glaciers (tres European) to the recent “enhanced water,” H2O has moved closer to the first-class cabin. But the latest version is a real head-scratcher: ionized, alkalinized water. Companies such as Chanson, Kangen, and many others are in the game to sell you a gizmo for $1,000 (or $2,000 or $3,000) to run your tap water through. The devices contain electrodes that purport to realign your water, split off some hydrogen atoms along the way, and rid it of various pesky problems so that it will taste better and be healthier and your arthritis will go away. In a week. Maybe two. So why all the excitement about ionized water? And didn’t we go through this already with air? We were going to ionize air, too, to purify it—until that didn’t work out so well. In fact, Sharper Image, a purveyor of one of these air ionizer products, lost a large lawsuit because of their too optimistic claims. Having read many articles and viewed countless videos about ionization and alkalization of water (for the intrepid, there is a book), I remain uncertain how the technology being hawked will help a single soul here in the United States. There isn’t even a crummy clinical trial to criticize. Nothing. The true believers make a point about America being behind Asia and Europe in the purchase and deployment of various home water filtering devices. They are correct here: And if I were living in Asia and maybe even Europe, where public health oversight for drinking water is far short of good-old overweening U.S. government standards, I might buy some filtering doodad, too. Not an ionize-alkalinize one but a cheap activated-charcoal sort to keep out gross impurities—the filtering done in the United States as a routine part of municipal water processing. But not to rework ions and the acid-base balance from tap water. Even by health fad standards, the science around ionization and alkalinization is remarkably thin. Here is the claim: We are ingesting food and drink that is set at a disadvantageous pH. You remember pH, the measure of acidity and its opposite, alkalinity (or baseness, as in acid-base balance), where perfect Swiss neutrality is 7.0. Any number below 7.0 refers to an acidic substance and any number above, alkaline. A more important pH to remember is this: 7.4. That’s the pH of the human bloodstream. We work very hard to stay exactly there. Every chemical reaction, all trillion or two our cells crank through daily, is optimized for 7.4. The body does not work well outside a tight range between 7.35 and 7.45; indeed much more variation and you’re liable to drop dead. Here’s an example of how seriously our body takes its ambient pH. People with emphysema retain carbon dioxide in the distorted nooks and crannies of their lungs, and the carbon dioxide converts to a mild acid that would upset the body’s entire acid-base balance. Your heroic kidneys compensate for the extra acid by hanging onto bicarbonate, thereby maintaining the 7.4 pH and keeping the body from collapsing. The body has a floating buffer system that shifts back and forth from the mildly alkaline (bicarbonate) to the mildly acidic (carbonic acid), depending on the need. * The stomach, though, is a factory of harsh acid, creating a pH of 2 or so—the better to denature bacteria and viruses and anything else that might make you sick. So the idea that moving some water from a pH of 7.0, where it usually lives, to a pH of maybe 8.5 and claiming a major health triumph is quite puzzling. The premise, I think, is that slightly increasing the pH in your stomach will keep the stomach from having to secrete so much acid and in turn spare the pancreas from squirting out so much bicarbonate, thereby giving all your organs a bit of a holiday. And that holiday means we don’t have pains or arthritis or die, maybe. So that’s alkalinization. Ionizing water for health is even more difficult to comprehend, but here goes: The ionizer splits water into its component parts, hydrogen and oxygen. The idea is that cleaving emancipates enslaved atoms from water’s neutral charge (hydrogen is positive and oxygen is negative) and that this liberation is salutary. You’re suddenly full of electricity, and everything feels better! This view that more ions are welcome stands in direct opposition to the free radical theory of disease. There, the bad guy is—you guessed it—a rogue negative charge looking for some unsuspecting molecule to glom onto and destroy, making you age and get arthritis and gray hair and all the problems that ionization sets out to cure. Water ionization and alkalinization is another fad without science to support it or even a particularly interesting group of nuts pitching it. But so what? One could argue that there is nothing wrong with snake oil, that the crime is victimless but for the money lost. Surely it is unlikely that people will ionize or alkalinize their way to illness. There is harm, however, in all of this, similar to the harm that comes from tolerating a parallel universe of chronic Lyme and antioxidant cures and autism-causing vaccines and countless other persistent, willful misconceptions of what cold-hearted, gimlet-eyed science long ago has disproved. Medicine and science are fragile entities, easily tarred and assaulted. People love to hate conventional remedies and advice, the schoolmarmish admonishments to eat less, exercise more, and wear a seat belt for gosh sake. How much more fun to embrace a retro-futuristic water ionizer that does whatever it does and makes the willies all go away. Stacked up against that sort of promise, what chance does methodical, earthbound science really have? Eventually it is the physician who seems the narrow-minded, dim-witted charlatan stuck on boring Earth, heavy shoes pulled down by gravity. Because it turns out that it is not science that people want but science fiction. Correction, March 22, 2013: This article misstated the amount of money spent on bottled water last year. It is $21 billion, not $21 million. This article also misstated the name of the acid that helps maintain the blood’s pH. It is carbonic acid, not carbolic acid.